Since 1993’s Whatever Aimee Mann has been releasing solo albums at a pretty consistent clip. While each of them is distinct in their own right she’s certainly honed a sound that’s all hers. That continues to be true on her latest release @#%&*! Smilers. Her previous release was a holiday album, One More Drifter In The Snow. @#%&*! 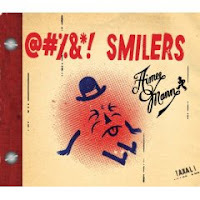 Smilers continues Aimee Mann’s string of strong efforts. One of the benchmarks of her solo work has been the ability to create indelibly vivid imagery with her words. Songs like “Thirty One Today” on this new release continue that trend. Accompanying the unshakeable images her words create are palettes of sound that set a mood and feeling that listeners would be hard pressed to ignore and not become part of, for a little while at least. On the one hand her songs seem perfectly suited to create accompanying videos for. Conversely though it’s preferable to let her words and sounds create slightly different images in each of her listeners heads. Songs such as the lead single “Freeway” are reminiscent of the more keyboard laden songs of her 2002 masterpiece “Lost in Space” while a song like “Phoenix” has a more sparse sound to it than most of the material on her recent releases. And that’s what sets @#%&*! Smilers apart from her last few albums, more diversity within the album itself. It’s too soon to say where @#%&*! Smilers will rank within Aimee Mann’s body of work. But considering how incredibly strong her solo work has been, it’s praise enough to say that it lives up to what she’s created before.